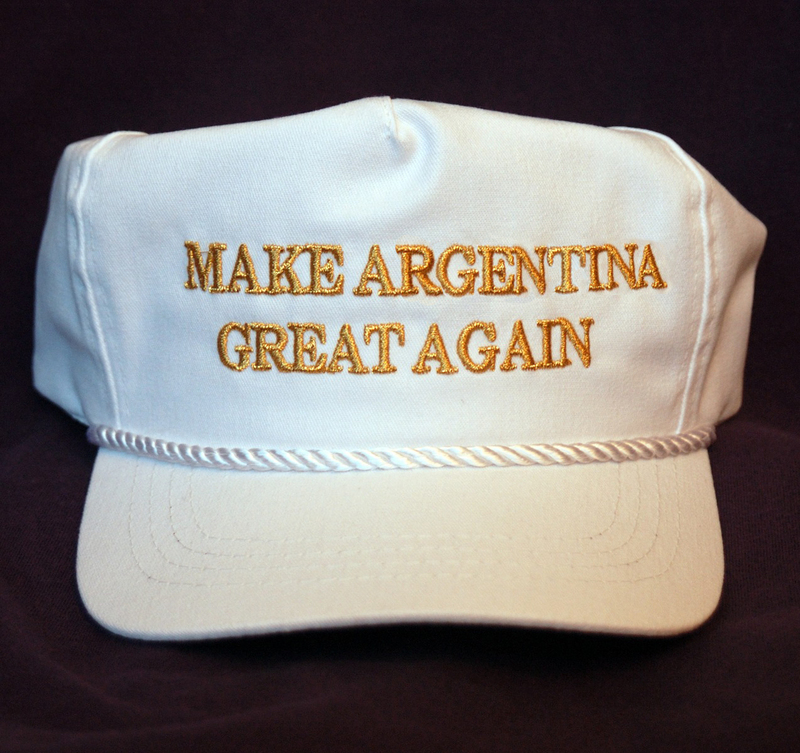 Although Macri and Trump have much in common, campaign slogans are not one of them. Macri ran in the 2015 election under the slogan “Let’s Go Together”. Photo by Spartan, modified by LASC. A heavily-manicured real estate mogul uses the financial and political clout gained by his father to run for president. During his campaign, he lets accusations of corruption fly at the opposing party (with undercurrents of misogyny) and scapegoats immigrants for a variety of problems. All this in spite of overwhelming evidence that he has been dodging his taxes for years. Shockingly, he is elected, and goes about slashing the public sector, claiming powers that do not belong to him, and enacting a slew of policies that harm his supporters and benefit his cronies in business. On the face of it, there is a worrying amount in common between Argentina’s Mauricio Macri and US President Donald Trump. But delving even deeper reveals the plethora of parallels between these two figures, who threaten to sandwich the Americas between two reactionary, right-wing demagogues. 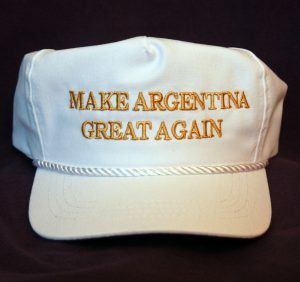 Much like Trump, Macri based his campaign on renegotiating trade agreements and external relations, pursuing an “Argentina first” policy of corporatism tinged with xenophobia. He has openly pursued a pro-business agenda that has only served himself, his family, and his business partners. While all this is explicit, and appalling, it’s what lies just below the surface that is most shocking. 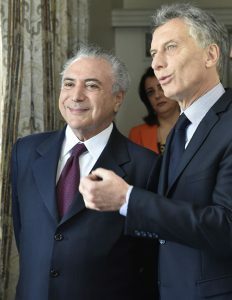 Doing away with years of campaigning calling for a renegotiation of Argentine debt on the part of former administrations, civil society organisations, and international solidarity initiatives, Macri sold his country out to the most voracious vulture funds soon after taking office. While opposing, rather than appeasing, these so-called “hold-outs” had effectively been policy since the original 2001 crisis, to Macri it was an outdated vestige of a country that had once considered people to be more important than profit. In a new Argentina, open for business at whatever the cost, it was little more than an obstacle. Michel Temer’s (left) right-wing politics helped ensure a fast friendship with Macri. Photo by Casa Rosada. Although Macri seems to have slightly more tact than Trump (he has yet to call all immigrants rapists – at least not in public) his foreign policy ranges from ignorant to outright malicious. A whistle-stop tour of Latin America he embarked upon shortly after assuming the presidency was a blatant effort to court economically powerful, right-wing, pro-market countries with largely European populations – Michel Temer’s Brazil becoming a fast favourite. For the poorer, largely indigenous populations of Paraguay, Bolivia, and Peru, Macri’s government has been an unending font of vitriol. According to Macri’s Security Minister Patricia Bullrich, “A lot of Paraguayans, Bolivians and Peruvians get involved as either capitalists or mules, as drivers or as part of the drug trafficking chain… [They] come here and end up killing each other for control of the drug trade”. In a widely-publicised slew of lies alternative facts, it was alleged that foreigners compose over 20% of the prison population. In reality, it is just shy of 6%. Even Trump’s infamous border wall may find its mirror image nearly 8,000km to the south, along the Bolivian-Argentine border. One deputy from the northern province of Salta went so far as to declare “I know the border very well, and a wall must be built… I agree 100% with Trump”. But with first lady Juliana Awada making extensive use of cheap Bolivian labour in her clothing line, echoing the fact that Trump’s own products are often emblazoned with “Made in Mexico”, all these efforts are underscored by a brazen hypocrisy. Indeed, both Trump and Macri could easily be accused of being businessmen first, politicians second. While Trump’s refusal to truly cut ties with his own business interests and those of his family have made headlines across the world, similar actions in Argentina have gone largely under the radar. Earlier this year, Macri attempted to forgive $296 million (US) in debt that his family business had accrued in the aftermath of the disastrous privatisation of Argentina’s postal service in 1997, in spite of an extremely generous repayment plan agreed upon in 2015. When confronted with this controversy, Macri’s cabinet chief, Marcos Peña, was unrepentant. Blaming the impasse on the “neglect” of the previous government, he went so far as to say that the delay itself was far more damaging to the state than the missing funds. Much like his North American counterpart’s uncanny ability to pin controversy on “fake news”, Peña instead blamed the press, saying, “In an electoral year, these discussions will always become political”. The decision was only reversed when the public anger and popular resistance that met it became too powerful to ignore. 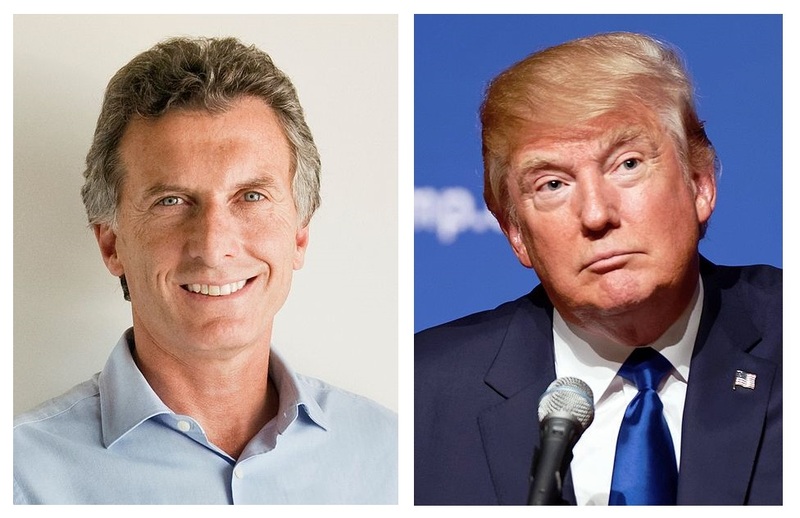 Mauricio Macri and Donald Trump have a storied past together. Photos by Inés Tanoira and Michael Vadon. All this should not overshadow the very real personal ties between the two families. The connections between the Macris and the Trump dynasty stretch back to the 1980s, when Mauricio and his father Francisco negotiated the sale of their Manhattan properties over a series of golf games in New York. In fact, this episode features prominently in the autobiographies of both the Macri patriarch and the current Commander-in-Chief. To Trump, “The Macri team had plenty of brainpower,” but lacked experience. Francisco, for his part, recalled how Donald broke his golf clubs in frustration after losing to Mauricio. Still, the two have remained close business partners, although these ties may have come back to haunt the pair. Macri’s congratulatory phone call to the newly-elected president last November raised eyebrows when it was alleged that Trump had used the opportunity to secure planning permission for his stalled “Trump Office” skyscraper project on Buenos Aires’ iconic 9 de Julio Avenue. Macri opted instead to use the call to ingratiate himself with the Trumps, stressing their lengthy relationship and bragging that he had known Ivanka Trump “since her infant days”. Worryingly, Donald’s erratic and hyperbolic manner of speech may be contagious – Macri soon “promised to establish the best bilateral relations ever”. Period. Yes, there is much in common between the two leaders. But we should not forget that all this behaviour is little more than a smokescreen to distract from the disastrous effects of their rule. Since taking office in 2015, unemployment in Argentina has skyrocketed, increasing by over 60% and leaving over 1.1 million citizens without work. By his own admission, 1 in 3 Argentines now live below the poverty line, relying on a rapidly deteriorating public service. One of many protests against Macri’s 100% increase in public transport fares. Photo by EMans. But to draw yet another comparison to his orange-faced ally to the north, his presidency has also brought about a level of protest and resistance not seen since the 2001 political and economic crisis. Women fed up with machismo culture, workers protesting mass lay-offs in the public service, environmental defenders seeking to protect Argentina’s natural heritage – thousands of people have united in their opposition to Macri’s policies. Even in Ireland, we each have our part to play. Just like our opposition to Trump, our response to Macri and his ilk should be global. While Macri may not dominate Irish headlines, while he may be a bit more suave, a bit farther away, it does not mean that our resistance to him should be any less powerful.